3 Stage Touch Dimmer Glass Shape Table Lamp 7.5x4"
Made of resin and iron, this square shape table lamp makes for a lovely décor item. Glass Fancy Free Fancy. Each lamp is topped with an empire shade. Shades are 10" across the top x 12" across the bottom x 9" on the slant. 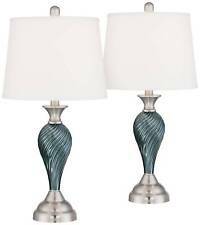 Arden Green-Blue Glass Twist Column Table Lamp Set of 2. Traditional lighting with high-end details that are within everyone's reach define the designs from Regency Hill. 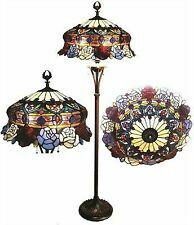 Tiffany Style Stained Art Glass Rose Shade Table Accent Lamp, Antique Bronze metal.Overall height approximately 20; stained glass shade measures 12" diameter.Purchased in early 1990's. Very good condition and well cared for. All original hardware and cord. Made in the USA. Bathroom Vanity Cabinet Top Sink Single Basin w/Mirror Marble Faucet 24" 28". Bathroom Vanity Cabinet Top Sink Single Basin w/Mirror Marble Faucet 24" Vessel. 24" Vanity Sink Top Cabinet Wood Bowl Vessel Faucet Mirror Bath Accessory Set. 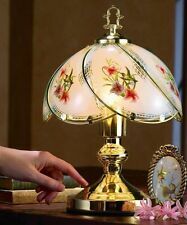 Table Lamp Floral Gold Touch Sensor 14.25 in. No more trying to find the switch in a dark room, this lamp is always ready for your touch. Use a single level light bulb, no need to use a 3-way bulb. 3 way switch featuring a night light (bulb not included). Designed and manufactured by Park Designs. Wooden base and finial. Maximum of 60 watt bulb, with 6 watt nightlight. It is high-quality handmade tiffany lamp with pieces of glass and glass beads. - Best choice of the desk lamp and bedside lamp with excellent quality and reasonable price. Bulb Specification: Uses 2 60-watt (max) bulbs in the shade and 1 7-watt (max) bulb in the base (BULBS NOT INCLUDED). Ikea LAMP Knubbig White Frosted Cherry-Blossoms Large 8-1/2" Tall Globe . FOR SALE IS AN IKEA CHERRY BLOSSOM STYLE ACCENT LAMP. IT MEASURES ABOUT 8.5". THERE ARE A FEW TINY SCRATCHES ON THE FINISH. BUT SO SMALL I COULDN'T EVEN GET A PHOTO THAT SHOWED THEM. Condition is good Used. Shipped with USPS Priority Mail. This mini plasma light sphere creates a magic display of light inside a hand-blown glass sphere. Just place your fingers on the glass surface and watch as colored bolts of glowing light follow your every move! Hummingbird Desk Touch Lamp. Both the hummingbird motif and lamp design reflect a delicate and rare beauty. Find a treasured spot for this lovely lamp. Sweeping, arched glass panels are accented with gold trim on the shade. It has three brightness settings– and a simple touch turns it on or off. A gorgeous addition to any room, it has a trio of blooms on the base along with a pair of glass leaves. Perfect for your desk or bedside table. This is a Tiffany Style table lamp that is graceful and polished. It is perfect by your bedside or on your favorite reading desk. (1) 100 Watt bulb max. Dark Antique Bronze Finish base. This floor shelf lamp with linen shade illuminates your living space in style with. - 2 x Shelf Floor Lamp. - Easy to use and install. - Protection grade: IP 20. Flat Heavy Duty base prevents lamp from tipping no matter what position the neck is in. - Eye Care lighting Adjusted by goose-neck lets you pivot lamp head over a variety of hobbies or tasks. - 1x Led Floor Lamp. A flared frosted white plastic shade sitting above a rich brushed nickel torchiere floor lamp distinguish this eye-catching lamp. Brushed nickel finish. Fixture Color/Finish: Nickel. Fixture Material: Steel. Each is 21 3/4" high overall. Base footprint is 4 3/4" wide. Shades are 10 1/2" high x 9 1/2" wide. Weighs 6 lbs. Built-in 2A type USB ports for powering your electronic devices. Brushed nickel finish. LED Lighted Mirror 1. Moreover, it has adjustable back stand, and makes any table into your makeup desk. By adopting frosted PC shade, the surrounded LEDs light gives off gentle, soft, and non-glare light. Handmade Turkish mosaic lamp. - When lit the lamp will bring a warm colorful light to any room. Built-in LED two-color 12W light source. 1x Magnifier. Switch mode: touch switch. 1 x Desk Lamp. 3-point adjustable architect style arms for close work, hobbies, crafting and more. Dual mounting options include both heavy duty weighted desktop base and a grip-tight clamp for mounting on various work surfaces. The light Bulb leviate and light up by simple but fasciating science, the levitation is the result of electromagnetic forces between the base and buld,the light bulb itself is powered through induction. Really cool looking Tiffany Style Stain Glass Dragonfly Desk Table Bankers Lamp Art Deco Bronze Base. The base has dragonfly detail. Opal house floor lamp. Condition is New. Shipped with USPS Priority Mail. Traditional lighting with high-end details that are within everyone's reach define the designs from Regency Hill. Shades are 12" wide at the top x 14" wide at the bottom x 10" high. Glass lamp body. Trending at $10.23eBay determines this price through a machine learned model of the product's sale prices within the last 90 days. This Lava® lamp spreads color and cheer! The rainbow graphics on the base and cap match perfectly to the rainbow of the multi-colored glass globe as the white lava oozes up and down, absorbing the different colors and changing tone. Add distinctive lighting to your decor with our Tiffany-Style Stained Glass Mission Style Table Lamp. A beautiful, functional accent for any room! 13W CFL bulbs included. 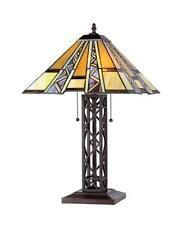 Tiffany-style stained glass Mission table light, A Plow & Hearth Exclusive: you'll only find it here! Item Type: Plasma Magic Ball. USB port powered, can connect the magic ball with your laptop PC or computer, easy to use and operate. 1 USB Cable. Weight: 232g. Color: Transparent Black. Anyway we will try our best to avoid this kind of thing. Victorian Tiffany Style Torchiere Lamp Torch Floor Lighting 70"
A lamp made of a glass base or glass shade is an elegant accent and functional lighting piece for your home. A glass table lamp can be placed in any room of the home, including a bedroom, home office, entryway, living room, or den. This style of lighting also makes it easier for you to do close-up tasks such as reading or knitting. What are the styles of glass lighting? Floor lamp - A glass floor lamp usually has a metal lamp base and glass shades for the lights. 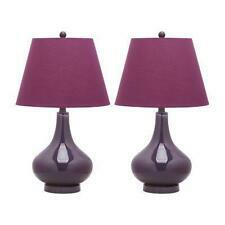 Bedside lights - Bedside lights are a smaller glass table lamp that provides muted lighting for the bedroom. They may have a metal or glass base and a fabric shade. 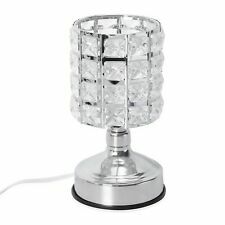 Table lamp - A glass table lamp is designed to sit on an end table and provide enough illumination to cover your immediate sitting area. It could have a metal or glass base and a fabric or glass shade. Desktop lights - Desktop lamps often have storage built into the base and a stem that can be moved for better lighting where you need it. Glass touch lamp - A glass touch lamp turns on or off its lights when you touch the glass shade. The base could be made from steel, nickel, bronze, or glass. How do you choose a glass lamp? Choose a style - Choose a floor, bedside, desk, antique table lamp, or modern table lamp. Choose a color of the lamp base and lamp shade - Clear glass may be used for the lamp shade or base. Some colors for a glass table lamp include white, bronze, bright, and pastel. A Tiffany-style glass table lamp has multiple colors, and the lights are diffused through the glass. Choose the number of lights - Most glass table lamps have one light while those that sit on the carpeting may have multiple fixtures. Choose a lamp shade and lamp base design - Antique designs include swirls, engraved scenes, flowers, and patriotic themes. An antique table lamp with a dark or thick fabric shade diffuses the light. Modern glass lamps may have a simple bell, cylinder, or conical shade and base made of clear, white, or colored materials. Glass table lamps with clear shades reflect more of the light, creating a brighter space. 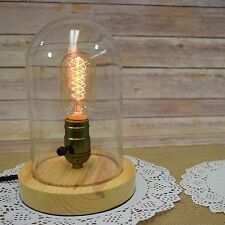 What kind of lightbulb can be put in these lamps? The type of bulb that you put into a table lamp can make a big difference in the amount of illumination that it provides. Most table lamps will accept an incandescent lightbulb. This standard bulb comes in clear, soft white, and colors. It releases a lot of heat, and the table lamp may become hot to the touch. Compact clear fluorescents use less electricity than incandescents. Some antique and modern table lamps accept energy-efficient light-emitting diodes.